Savos Aren is a Dunmer conjurer and the current Arch-Mage of the College of Winterhold. Always buried in work and his own thoughts, Savos has entrusted Master Wizard Mirabelle Ervine with most of his daily duties, a decision that has left a lot of the lesser-ranked College members quite puzzled and frustrated. 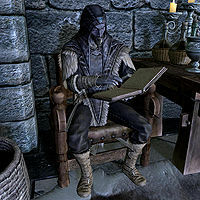 During Aren's leadership of the College of Winterhold, the Thalmor sent Ancano, one of their agents, to be his "advisor", though Aren seems strangely unaware of his hidden agenda. Unfortunately, when you bring in The Eye of Magnus, Ancano powers himself with the artifact and Savos Aren will realize his advisor's true intentions too late. As Arch-Mage, Savos has his own quarters, located above the Arcanaeum, and he spends most of his time there. He starts the day at 7am with a one-hour breakfast, then heads down the stairs to the Hall of the Elements where he spends three hours wandering around. At noon he takes a one-hour lunch in his quarters. At 2pm on Morndas to Fredas, he heads out into the courtyard where he stays until 6pm, occasionally talking to his second-in-command, Mirabelle Ervine. At 7pm he takes a one-hour dinner. At all other times, he can be found inside his quarters, either relaxing in a chair, eating, or using the alchemy lab. He was supposed to sleep in his bed between 1am and 6am but doesn't due to a bug. There are several exceptions to this routine; see this section for details. He wears the enchanted and unique Archmage's robes and a pair of boots with a Resist Shock enchantment. He carries nothing but a red apple. He knows a number of spells, specifically Fireball, Incinerate, Steadfast Ward, Close Wounds, Stoneflesh, and Flame Cloak. He also knows the Conjuration spells Conjure Frost Atronach and Conjure Dremora Lord. When you get near him he will state: "What you learn here will last you a lifetime. Several, if you're talented. 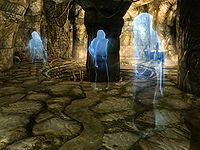 ", "It's no secret that the College's reputation in Skyrim is... tainted. ", "Please don't do anything to anger the locals. They don't need additional reasons to hate us. ", "It is not the place of the College to become involved in local politics. ", and give you insight in what he tries to accomplish: "Someday the College may be fully accepted by the Nords. I hope that my work as Arch-Mage may help." Even if he is a bit distant, he will be quite polite if you talk to him, saying: "You are new here, are you not? We have not spoken." Two responses are available; if you choose to say 'no, we haven't' he will introduce himself: "Then allow me to introduce myself. I am Savos Aren, Arch-Mage of the College of Winterhold. I am quite content to see nearly any aspect of magic explored and investigated here. But I do not and will not approve of any research or experiments that cause purposeful harm to your fellow members of the College. Are we clear?" If you choose the second option and refer to him as 'sir' he will say: ""Sir"? How quaint." and will then proceed to introduce himself and ask the same question as with the other option. He will then provide a wealth of information on the College and its background. If you remark that dangerous research must be a problem, he will explain: "Not often, no. Some risks must be taken, to be sure. I am simply trying to avoid untimely deaths. We also must make an effort to avoid worsening what Skyrim thinks of us." When asked about the purpose of the College, he will say: "Purpose? I should think it's self-evident. Magic is a true power, not something to be shunned by commoners or treated as an amusing diversion by politicians. It shapes worlds, creates and destroys life... It deserves proper respect and study. The College is a place where we can focus on that, without the pressures of the world weighing down on us." He will also tell you about the turbulent history of the College: "I've seen documents dating back to the late Second Era. Beyond that, it's hard to say. Events in the last several hundred years resulted in a significant loss of our history, I'm afraid." He will then elaborate on past events: "The Great Collapse, as it has come to be known. An unfortunate natural disaster that ravaged the area. 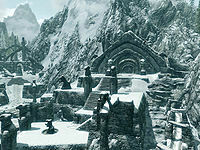 The College fared far better than the city of Winterhold, but it was not left untouched." Then he will provide information regarding the collapse: "No one is sure of the cause. Some believed the eruption of Red Mountain had far-reaching consequences that were only felt years later. I know there are some who have blamed the College, said that we were responsible. I assure you this is not the case." You can then ask him to tell you even more about the natural disaster: "The Sea of Ghosts practically came alive. No one was expecting it. Monstrous waves battered the shore for weeks on end. Winterhold was ancient and weathered, but it couldn't withstand the sea's fury. Entire districts of the city were lost overnight. The waves receded in time, but the damage was irreversible. 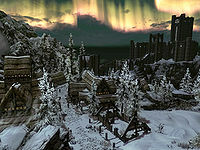 Most residents of Winterhold abandoned what was left of the city. The College survived, and so here we remain." 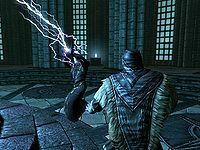 When talking to Ancano, Arch-Mage Savos Aren's shady Thalmor advisor, he will explain his role at the College: "I am an advisor to the Arch-Mage. The Thalmor wish to promote relations with your College. I am at the Arch-Mage's disposal if he requires advice." If you ask how often this happens, Ancano will admit that Aren rarely seeks his help: "Perhaps not as often as he should. In time, I believe he will be more trusting." Members of the College will also comment on Savos' approach: "Savos doesn't care for politics. He likes to believe the College is removed from the rest of Skyrim." and "If he could, Savos would float the the [sic] entire College above Skyrim, for all the Nords to see." Many of them see Mirabelle as the next Arch-Mage as she is in charge anyway: "She's the Master-Wizard here. Arch-Mage Aren may be in charge, but Mirabelle runs the place. ", while others will comment on Savos' way of handling problems: "Arch-Mage Aren's approach to these things is to just let them sort themselves out." While Mirabelle Ervine takes care of all of the Arch-Mage's College duties, saying: "While technically in charge of the College, the Arch-Mage's responsibilities often keep him occupied. Thus, I run the day-to-day operations. 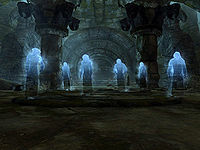 ", Savos will keep a low profile until the very final stage of Under Saarthal when Tolfdir asks you to deliver the news about the strange Orb directly to the Arch-Mage, saying: "I don't dare leave this unattended. Can you return to the College and inform Savos Aren of this discovery? Please, hurry." At that point, Savos will skip his entire schedule and will sit in his quarters, reading a book all day long and only takes a break to wander around between 2am and 7am. When you say that you need to speak with him about Saarthal, he will respond: "Please don't tell me that another one of the apprentices has been incinerated. I have enough to deal with right now." You will have to choose between two options, both of which will net you a surprisingly uninterested reaction. If you say that something important was found in Saarthal, Savos will comment: "Very well, I trust that you wouldn't be here were it not significant. Thank you for bringing this to my attention. Tolfdir normally looks after your little group, yes? Since he's apparently occupied, and I will need to see this discovery for myself, I think perhaps you should begin researching the subject. Speak with Urag in the Arcanaeum. See if he is aware of anything that matches your discovery. And... good work. The next time you find yourself exploring Nordic ruins, perhaps this will be helpful." If you instead mention the Orb directly, his response will be: "I... see. I trust that Tolfdir will provide a more... specific explanation." He will then thank you for bringing it to his attention and will proceed as with the first option. Both replies will finish Under Saarthal and start the quest Hitting the Books. You can also ask him if he ever met with the Psijic Order and he will respond: "Personally? No, not I. One of their number used to advise the Arch-Mage when I was but an Apprentice here. But that was a great many years ago, before all the members of the order were called back to the Isle of Artaeum, and it disappeared entirely." 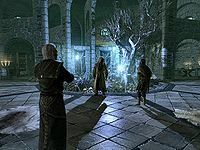 When you have returned the missing books to Urag gro-Shub, thus initiating the quest Good Intentions, the Arch-Mage's Quarters will be locked once again because of a very special visitor from the Psijic Order. When Ancano has insulted Tolfdir and asked you to follow him, he will lead you up to the Quarters where a puzzled Savos Aren will be accompanied by Psijic Order member Quaranir. After slowing down time, Quaranir will privately warn you against the Eye of Magnus. When you return to normal, Quaranir will leave the College grounds and Savos Aren will be just as confused as Ancano: "I'm... I'm not sure what happened. A monk from the Psijic Order, here, after all these years, and then he just leaves. I hope we didn't offend him somehow." If you ask him what the Psijic wanted he will respond: "Beyond asking for you, he never said. Very strange indeed." When you ask him about the Augur of Dunlain he will brush you off without a straight answer: "Has Tolfdir been telling stories again? I thought I made it quite clear that this was a subject inappropriate for conversation. Please don't allow him to continue to discuss the subject." 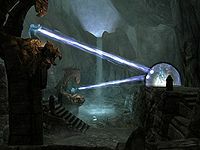 Still not realizing the potential threat from the Eye of Magnus, he will then return to his normal schedule until you return from The Midden. After your informative conversation with the Augur of Dunlain, you are told to report back to Savos Aren with the alarming news about the Eye. When you surface from the Midden, Savos Aren will be found in the Hall of the Elements around the clock, finally interested in the Eye. When you tell him you have important news he will ask: "Really? And what might that be?" When you tell him that the Staff of Magnus needs to be located, he will respond: "I'm sorry, what? Well... I'd certainly love to have such a powerful staff, but I'm not really sure that any of us need it." When you tell him it is connected to the Eye, he will be curious: "And how do you know this?" When you tell him you spoke to Augur, he will be impressed: "Did you really? And he specifically mentioned the Staff of Magnus? I... I'm impressed with your initiative. Of course, someone will need to follow up on this." If you say 'you mean me, don't you' he will start with: "I certainly do. Since you went so far as seek out the Augur for advice, I thought you'd be more enthusiastic." If you instead ask him what to do next, he will start his orders with: "A most impressive attitude. Keep this up, and you'll do quite well for yourself." Both options will lead him to point you towards Mirabelle Ervine: "Something as specific and ancient as the Staff of Magnus... I'm not sure we'd ever find something like that... I seem to recall Mirabelle mentioning the staff somewhat recently. Why don't you see if she can tell you anything? I'm quite pleased with your progress, you know. You've certainly proven yourself to be more than a mere Apprentice. Well done. This circlet once proved invaluable to me. I hope it can be of use to you now." This ends the quest and starts the next one, Revealing the Unseen. Mirabelle: "I don't know. It's like a ward, but who's casting it? Ancano? How?" Savos: "I don't care what it is, I want it down now! I want to know what he's doing in there!" "Ancano! Stop this at once! I command you!" Savos: "Ancano! Stop this at once! I command you!" Mirabelle: "Don't go near him!" A flash of white light will then emerge from the Eye of Magnus and knock you off your feet. When you come to, you will find Mirabelle wounded and Savos Aren nowhere to be seen. Mirabelle will then ask: "Ancano is doing something with that thing... the Eye. We can't stop him! I haven't seen Savos since the explosion. He must've been blown clear, and he may be injured. I need you to find the Arch-Mage, and I need you to do it quickly. Get moving!" When you ask her what happened, she will ease your worries about her: "I'll be fine. I just need a minute to catch my breath. Find Savos..." Sadly, when you enter the courtyard, you will find the dead body of Savos Aren, seemingly killed by the blast. Shocked College members will be gathered near the fountain, stuttering: "What's happened? He's not...", and "Is he dead?" but Tolfdir will quickly approach you and after saying: "I can hardly believe it. ", point your attention elsewhere, as Winterhold is in desperate need of help. When you return from Winterhold, Savos Aren's body will be gone. Savos: "Come on, we're finally here! Let's not waste any more time!" Takes-In-Light: "Are we truly sure this is a good idea?" Atmah: "We'll be back at the College before anyone even knows we're gone." Girduin: "You would care about that, since you're the Arch-Mage's favorite!" Savos: "Don't forget, this whole idea was Atmah's to begin with." Hafnar: "Let's just get inside, see what's in there." "I can't believe we're doing this." Elvali: "I can't believe we're doing this." Savos: "Can you imagine the looks on their faces when we come back?" Hafnar: "You keep talking like you're sure we'll find something useful in here." Girduin: "Given the history of this place, it's more than likely there's still some amount of power here." Savos: "Enchanted weapons, tomes of ancient knowledge, Shalidor's secrets themselves -- who knows what we could find!" Takes-In-Light: "And what if... What if there are things guarding this place?" Atmah: "Against six College-trained mages? I think we'll be fine." Elvali: "We... we have to go back. We can't leave Girduin..."
Hafnar: "We barely made it out alive, and you want to go back in?" Atmah: "It's too late. There isn't enough of him left to go back in after." Takes-In-Light: "Gods, what have we done?" Savos: "We can't go back. Might as well go forward. We can still do this." Atmah: "Savos is right. We can make it if we just stay alert." Savos: "Come on, we can't stop now. We have to keep moving!" Atmah: "Where's Elvali? She was right behind me." Hafnar: "Dead. Something grabbed her from behind. Gone before I could do anything." Takes-In-Light: "This is insanity. We never should've come here." Atmah: "You're right. This is all my fault. Should we turn around, head back?" Hafnar: "I don't think going back is a good idea." Savos: "Going back would be the end of all of us. We keep pushing forward, and we'll make it. We will!" Atmah: "Come on, you can make it. Let's go." "We're not going to make it, are we?" Atmah: "We shouldn't have left her there to die!" Savos: "What else could we do? Stay there and die with her? She refused to go on, we didn't have a choice!" Hafnar: "This is it, you know. Through this door. Can you feel it?" Atmah: "We're not going to make it, are we?" Hafnar: "We stay together, no matter what. Agreed?" Atmah: "I'll be right with you." Savos: "Agreed. We all stay together." Savos: "...I'm sorry, friends. I'm so sorry! I had no choice! It was the only way to make sure that monster never escaped! I promise you, I'll never let this happen again! I'll seal this whole place away..."
He will then disappear, never to be seen again. "I knew you'd come eventually. It would seem I'm bound to this place. The bitter irony of it all -- my greatest failure, and even in death I can't escape it. I never meant for any of what happened here. Tried to seal it up, lock it away forever. But now it all comes out again..."
"There were six of us. Full of ambition, eager to conquer the world. It was Atmah's idea to come here, at first. She talked me into it, and I convinced the others. We were sure we'd find it all here, hidden away from time. Power, knowledge... All the things we didn't want to wait for. We thought it would be so simple." "Girduin died first. It happened so fast, none of us had a chance to react. One moment we joked about what we'd find below, the next he'd been ripped in half. And then we were all fighting just to survive. None of us were prepared. It was amazing the rest of us survived. When it was over, Atmah, Hafnar and I stared, pale-faced, at one another, unwilling to admit we'd made a terrible mistake. We could have turned back. It could have ended there. But we kept going." "Elvali died here. I don't even remember what killed her. One of the countless faceless horrors. I think she was glad, in that final moment. Hafnar was covered in blood, but his stupid Nord pride wouldn't let him admit defeat. I... I don't know why I pressed the others on, convinced them to keep going. "If we can just make it through, it'll all be worth it", I told them. And the fools believed the words I myself didn't trust." "There were only three of us left. Takes-In-Light just sat down and gave up, and we left her there to die. I've no idea what killed her, but I'm sure something did. Atmah cried to herself. Hafnar wouldn't look at either of us. And I kept telling them it would be all right. I was in charge now. I pushed them on, insisting it would be worse to try and go back. What happened after was my fault. All mine." "We all knew this was the end. Without even opening the door, we knew what was behind it would kill us. None of our spells were potent enough, none of our wills were strong enough. "No matter what, we stay together", Hafnar said. I looked him in the eyes and lied to him." "I had no choice, don't you see? I had to leave them behind, had to sacrifice them so I could make it out alive. If we'd all died there, if we'd loosed the thing on the world, who knows what might have happened? That's how I consoled myself for years, after I'd sealed this place shut and vowed never to let anyone open it. Now you've put it all to rest, but it can't undo my mistakes. They can never be undone..."
The ghost you meet in Labyrinthian is an alternative version of Savos Aren, with the BaseID (000D07DB). Savos was supposed to sleep in the Arch-Mage's Quarters between 1am and 6am. However, his bed is located 1300 units away and Savos is only allowed to travel 500 units to find it. As a result, he wanders around all night long. This page was last modified on 17 October 2018, at 22:15.